The Pocono Raceway in Pennsylvania has gone solar and is now powered by a 3 MW European designed solar farm—with some unique features—that supplies the raceway with the power it needs and feeds additional power into the grid. The words “NASCAR” and “green” aren’t normally used in the same sentence. But that might be changing, especially with the installation of the 3-megawatt solar farm at the Pocono Raceway, in Pennsylvania. Brandon Igdalsky, president of the raceway—home of the Pocono 500 and many other races—was interested in powering the facility with a photovoltaic (PV) power plant. After discussions with project developer enXco, they decided to go ahead with the project in 2009. Belectric Inc. was selected by enXco in 2010 to design and build the plant. Belectric, although relatively new to the U.S., came with years of experience in the solar industry. Its parent company, Beck Energy, has built over 400 megawatts worth of utility-style solar farms throughout Europe. 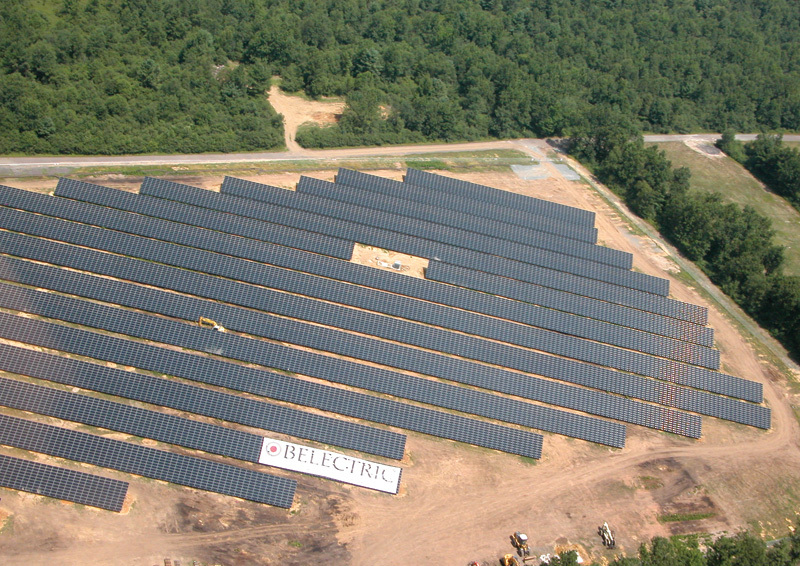 The project sits on approximately 25 acres and consists of nearly 40,000 photovoltaic modules. It was built on land formerly used for parking lots that are no longer needed due to a reconfiguration of other parking lots on raceway property. Oregon, and the steel from California. The power plant was not only unique in that it would probably be the largest privately-built solar farm in the U.S., but its design was also revolutionary. Despite its unique aspects, construction was phenomenally fast. Construction started in May 2010 and was completed by the end of July 2010, with just some fine-tuning remaining. Because PV power plant design isn’t common knowledge, the team was also prepared for the questions that typically arise. “It also helped that the Tunkhannock County Building Department was easy to work with,” adds Taggart. The Pocono solar farm posed certain challenges right from the start. Second, the point where the solar farm hooked up to the grid was toward the “end of the line”, which meant the voltage was low compared to where large power generation takes place. Also unique to this design is that it is a high voltage system and runs at 900 volts—most PV power plants in the U.S. run at 600 volts. By using the higher voltage system, Belectric was able to save a lot of system costs. “It’s also quite a bit safer when combined with another unique feature—a floating ground power plant,” says Taggart. A floating ground power plant differs in the way energy is collected in the power plant. Going with a floating ground design gave Belectric more freedom on selecting and installing components. 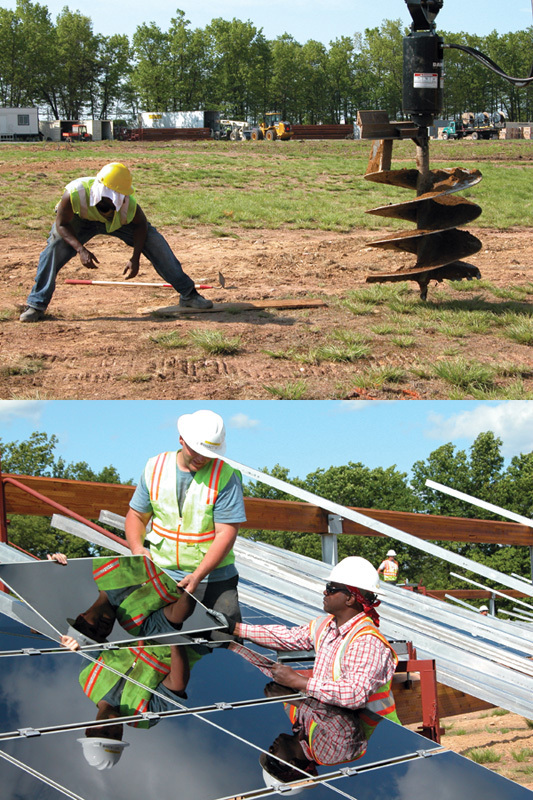 The majority of work on the solar power project was performed by Belectric employees and union sub-contractors. But because the local community has been particularly hard hit by the economic downturn, Belectric also chose to hire a range of local laborers and construction personnel. The high voltage and floating ground power plant are fairly standard in Europe but new to the U.S. That required Belectric to design the Pocono power plant so the new features were compliant with the U.S. codes. “Quite a challenge!” says Taggart. The design may have its roots in Europe, but the hardware for the power plant was all made in the U.S. Modules were purchased from First Solar, and all structural components were purchased in the U.S. as well. Nothing was imported. Belectric chose Satcon PowerGate Plus inverters for the project. “They were a good fit between our system design and the capabilities of the inverter,” says Taggart. The PowerGate Plus inverters maximize system uptime and power production, even in cloudy conditions. In addition, all the components are encased in a single, space-saving enclosure, making the inverters easy to install, operate, and maintain. A majority of the work was performed by Belectric employees and union sub-contractors. Because the local community had been particularly hard hit by the economy, Belectric chose to hire a range of local laborers and construction personnel. Belectric employees trained them on the nuances of module installation and plant construction. The 3 MW power plant creates enough energy for the raceway, the nearby vacation village with condominiums, recreational areas, and a golf course, as well as an additional 1,000 homes in the local community. “Whatever the raceway doesn’t need goes to the grid,” says Taggart. “It’s a net metering program. So they are almost always getting paid for energy coming from the power plant.” This income should allow the investors to pay off the project in approximately five years. One of the reasons Belectric has been able to complete projects so quickly and economically is, in part, how they build their power plants. “It’s our only product. For that reason, we have geared the company kind of like a factory,” says Taggart. Many of these employees have families, so Belectric rotates them much like the military. They are never away from home for more than six weeks at a time. And when they come home, it’s for an extended “on call” period. Also, new employees must learn every job on the project, regardless of the role they were hired for. The Pocono raceway, located in the Northeast, had one last challenge. It wasn’t in an area known for its sun. Taggart says that was fine with them. The Southwest has the premium solar crop, and companies get the most yield for their investment there, but the Northeast has stronger incentives. Perhaps more importantly, Belectric’s technology is ideal for the climate. “The way we design our plant and the modules we employ are optimized for a particular project. In this case, the thin film modules are very efficient at generating power in the typical Northeast environment, where there is a lot of diffuse light given the cloudy days and very hot, high humidity air in the summer. The new project is generating plenty of interest and, at one point, there was talk of President Barack Obama coming by for the opening ceremony. 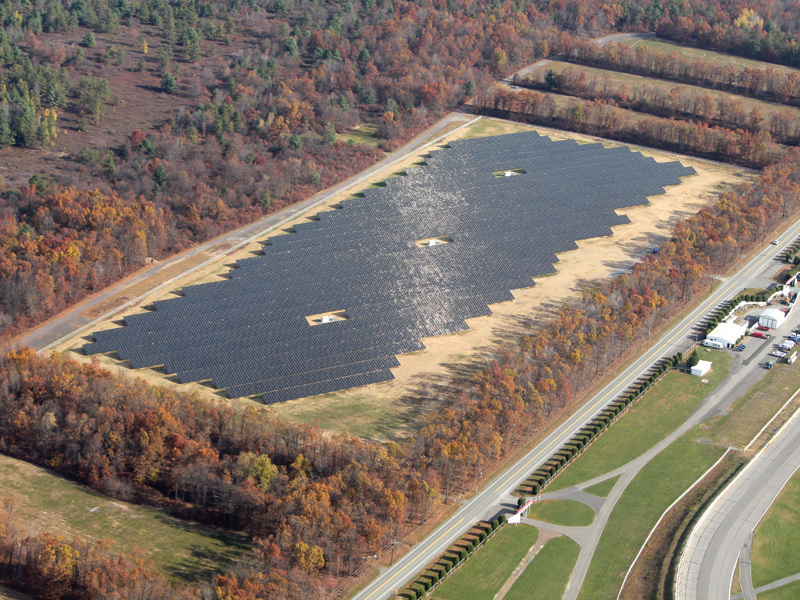 The Pocono Raceway solar project sits on approximately 25 acres and consists of nearly 40,000 photovoltaic modules. It was built on land formerly used for parking. Belectric lets the price tag speak for itself. Of the estimated $16 million cost of the project, Belectric’s piece was a relatively small portion of it. One of the ways Belectric keeps the plants affordable is by building “spec” power plants. An example of this is a PV power plant similar to the one in Pocono, being built in Sacramento, California. This plant will be 30 megawatts—10 times the size of the raceway project. The project, however, is 100 percent Belectric’s from start to finish. “We build the power plants to sell,” says Taggart. “The reason we do that is because, if we’re a factory and our product is a PV powerplant, we need to get the volume of the factory to be pretty uniform to maximize efficiencies. Buyers find these power plants attractive because the risk has been removed. The plant is already generating power, and the price the utility will pay has already been determined. “You know the lifetime of the power plant, and you can easily figure out what the price should be,” adds Taggart. Because of the company’s experience in Europe, their factory model and ability to keep costs down, Belectric sees itself being in the industry for years to come.